Kloubec Fisheries is one of the Midwest's largest fish producing operations. We are a 3 generation, family owned & operated fish farm situated in Amana, IA. Originally conceived by Myron's father, Leonard Kloubec as a hobby in 1976, it was later developed by Myron into a permanent alternative agriculture business in 1981. The business met with huge success, supplying a wide variety of fingerling stock into numerous recreational areas and privately owned ponds. 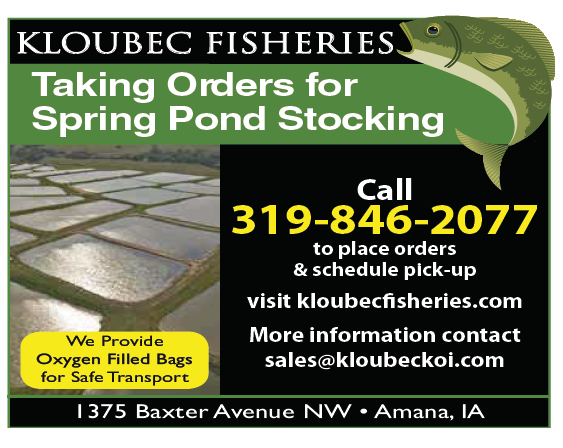 We are your best source for game fish and koi for sale in Iowa! With over 30 years of award winning experience, we always put fish health as our top priority! Our facilities are second to none and we love opening our doors to the public for a weekend each spring and fall for our semi-annual Game Fish Open House. We know your pond is important to you, and we are here to offer you expert advice about pretty much anything from duck weed to aeration. Give us a call, we'd love to hear from you!